An original letter of correspondence between brothers and business partners Joshua Coffin Chase and Sydney Octavius Chase. Topics discussed in the letter include the disharmony between A. Q. Lancaster and T. J. Eubank and the excessive amount of grapefruit and valencia orange acreage in South Florida. Original letter from Joshua Coffin Chase to Sydney Octavius Chase, January 23, 1911: box 49, folder 20.84, Chase Collection (MS 14), Special and Area Studies Collections, George A. Smathers Libraries, University of Florida, Gainesville, Florida. Digital reproduction of original letter from Joshua Coffin Chase to Sydney Octavius Chase, January 23, 1911. 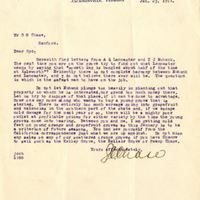 Herewith find letters from A Q Lancaster and T J Eubank. The next time you are on the grove try to find out what Lancaster means by saying that "something is bungled about half of the time at Isleworth"? Evidently there is not complete harmony between Eubank and Lancaster, and I do not believe there ever will be. The question is which is the safest man to have on the job. Do not let Eubank plunge too heavily in planting out that property in which he is interested, nor spend too much money there. Let us try to dispose of that place, if it can be done to advantage. Someone may come along who wants to buy a young grove that is started. There is entirely too much acreage going into grapefruit and valencias in the southern part of the state and, if we escape could damage for the next year or so, there will be a mighty poor outlet at profitable prices for either variety by the time the young groves come into bearing. Between you and me, I am getting cold feet on young orange and grapefruit groves as this January is to be a criterion of future seasons. You can see yourself from the California correspondence just what we are up against. Do not miss any sales on any of our scattered orange groves if you have Chance to sell such as the Kelley Grove, the Bellair Grove or Swamp Chase. Chase, Joshua Coffin. 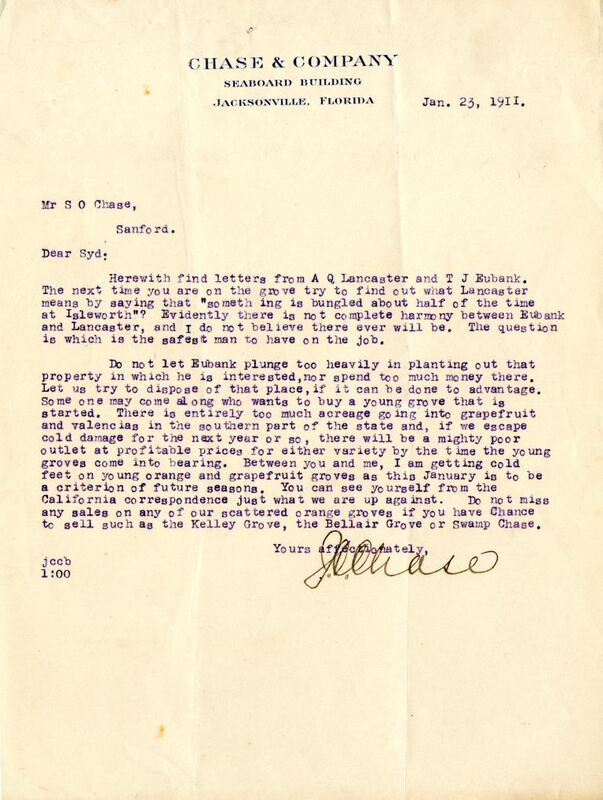 “Letter from Joshua Coffin Chase to Sydney Octavius Chase (January 23, 1911).” RICHES of Central Florida accessed April 24, 2019, https://richesmi.cah.ucf.edu/omeka/items/show/2720.